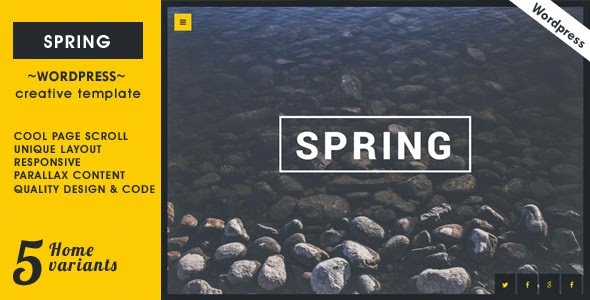 Spring is an creative one page WordPress Theme. This theme is simple, clean and elegant one page template with perfectly responsive (Bootstrap 3 framework). Featuring cool home page, cubeportfolio $8 value and multipurpose. It is easy to customize and well documented to suit your needs. Includes 4 stunning home variants to choose from. Item Reviewed: Spring Creative One Page WordPress Theme 9 out of 10 based on 10 ratings. 9 user reviews.